LiveU Solo enables Huffington Post to live stream video to Facebook. 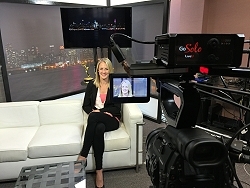 Hackensack, NJ, May 2016: With the opening of the Facebook Live API, brands can now live stream video content directly to Facebook using high-quality production equipment. This has been extremely important to broadcasters and video content creators that want to deliver non-stop live video coverage to the Facebook community. LiveU, a pioneer in live streaming technology, has created a new ‘plug and play’ live streaming bonding solution that connects automatically to Facebook, enabling broadcasters and content creators to deliver rock-solid, highly produced video streams. The Huffington Post, a leading global source of breaking news, opinion, entertainment and community, and an early adopter of LiveU Solo, is utilizing the technology to deliver high-quality live video to a wider audience on Facebook. Optimized for online video performance, Solo delivers the rock-solid video streams LiveU is known for by using LiveU Reliable Transport (LRT™) protocol’s integral adaptive bit rate and forward error correction technology. LiveU Solo connects automatically to Facebook Live, Wowza Streaming Cloud™, as well as other popular CDNs, OVPs and YouTube Live, making live video simple. Solo can be managed and controlled remotely via a web interface or smartphone. To learn more about LiveU Solo, visit www.liveu.tv/liveu-solo.